Welcome to the Home of the High Flying Haflingers! 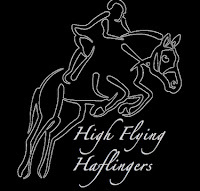 We are a drill team of jumping haflingers and girls that range in age from 15 to 36. We love to demonstrate the versatility, willingness, and athleticism of our haflinger horses. Check out a video of our latest performance!